This is the best homemade strawberry jam recipe from scratch and it is a blue ribbon winner. I remember as a child, picking strawberries and eating them right then and there. I picked for quite some time, but did not manage to bring many berries home. I love anything with fresh strawberries in it. I especially love having this homemade berry jam on a slice of toasted homemade bread. I could eat the entire loaf when this jam is smeared on it. It is one of my freezer jam recipes - so simple to make and delicious. Use this recipe for any other fruit like raspberries, blueberries and blackberries. Slather it on my homemade bread, homemade biscuits and homemade angel food cake. Use it as a filling in my homemade Victoria Sponge cake recipe. Or, just use a spoon. It's so simple to make, and will disappear fast. It's a good idea to make a double or triple batch at a time. It is so worth it and you will be glad that you did. You are going to use plastic containers to store this in, you need to sanitize them. Rinse the container and lids in boiling water and make sure they are completely dry. In a bowl, add the strawberries one layer at a time, and crush them with a potato masher. Measure exactly 2 cups of berries, and place into a large bowl. Stir in the sugar, and let stand for 10 minutes - stirring occasionally. Fill the dry plastic containers right away to within 1/2" from the top. Wipe off the edges and seal immediately. Let stand at room temperature for 24 hours. It is now ready to devour. You can keep it in the refrigerator for 3 weeks, or in the freezer for 1 year. If frozen, thaw frozen jam in the refrigerator. 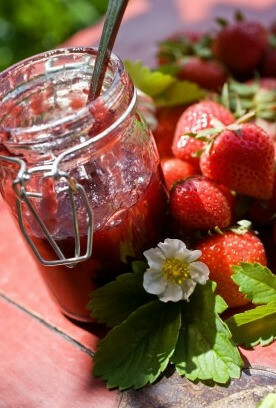 An excellent homemade strawberry jam recipe.